When you're building shelves for residential, commercial or industrial use, you need hardware that can hold up to anything you throw on it. 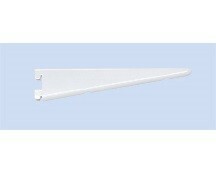 Double slot shelf brackets from WoodworkerExpress.com are made to the highest standards by trusted brands such as Knape and Vogt, Reeve Equipment and WW Preferred. Constructed with 14-gauge steel and other rugged materials, linking them into a matching shelf standard can provide support for 200, 300 and even 400 pounds of storage items depending on bracket length. Their superior width-to-depth ratio gives you more stability when loading and unloading. We carry double-slotted brackets in all sizes, from five-inch shelf brackets for books and DVDs, to giant 24-inch brackets for auto repair shops or fireplace mantles. Their simple design, easy installation and adjustability have made them a hit in homes and industry alike. A number of finishes such as white, zinc, black and almond provide additional decorative options for both function and form. Add in our low prices, fast ordering and 30+ years of industry experience, and double brackets from Woodworker Express are a clear choice. Save even more by adding a PRO membership for unlimited free ground shipping!